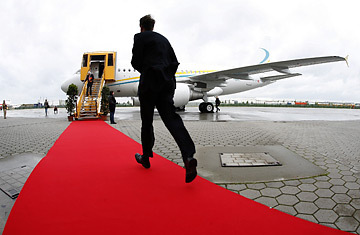 A guest runs over the red carpet to an Airbus A318 Elite jet. These days companies might be keeping a close eye on costs and CEO pay, but execs are increasingly bingeing on corporate travel. Even as the commercial airlines have upgraded first- and business-class cabins and new premium-class-only carriers have emerged to attract business fliers, many executives consider private-jet use preferable to commercial flying because it can be more time-efficient while allowing for a personal touch in business. But as private jets increasingly clog the skies, airline groups and the Federal Aviation Administration (FAA) are demanding that they take on more fiscal responsibility in the booming industry. An increased demand for corporate jets has also brought a need for more pilot training. By some estimates up to 20,000 new pilots for both corporate and commercial jets are needed globally each year to account for a disruption in the supply chain that occurred over the last five years. CAE provides training to pilots at 24 training centers worldwide, four of which are devoted exclusively to business-jet training. One such facility, the SimuFlite North East Training Center, opened last week in Whippany, N.J., and has six flight simulators for training on models from the Gulfstream 4 to the Rolls Royce of corporate jets, the Falcon 7X. Due to high demand, CAE plans to add six more simulators to that center, and will open its 25th training facility next year in Bangalore, India. At $15 million a pop, these simulators don't come cheap. Approved by the FAA (and sometimes also by the Joint Aviation Authorities in Europe), each simulator has digitized versions of the 85 largest airports in the world, runs on the equivalent processing power of 500 Xboxes and does everything the same model aircraft would do. Being able to safely navigate through low visibility and a ceiling of 800 ft. or to land smoothly after a fire in the left wing's engine prepares pilots for their first experience piloting an actual aircraft, which could be loaded with passengers. But as executive travelers and manufacturers laud the global corporate jet boom, the FAA, airline groups and commercial airlines are less enthused. They contend that not only do corporate jets add to traffic congestion in the airspace, but the six types of taxes that are built into commercial passengers' ticket prices effectively subsidize the aviation system and facilities used by corporate jets. By one estimate, various fees and taxes paid by commercial passengers have totaled $104 billion over the past decade. Corporate jets, on the other hand, pay only about 6% in taxes and fees for flying and for using the federal Air Traffic Control (ATC) system. "The airlines pay a disproportionate part of the system," says FAA spokeswoman Laura Brown. "Business jets are an important part of the general aviation category and under the current structure [they] don't pay for the financial system." Commercial airlines and their passengers pay about 95% of the taxes but only account for 73% of the costs of the air traffic system, according to FAA administrator Marion Blakey. The idea coming before Congress is to overhaul the current system in favor of satellite GPS technology and aviation-funding strategies that would also include a new user-fee system to bring the amount that corporate fliers contribute in line with their use of the ATC and airports. Some in the industry wonder, however, if this kind of corporate accountability will get off the ground.